Todd Gitlin. Image from Pew Forum. We discuss the so-called ‘Golden Age’ of journalism highlighted by the distinguished coverage of the Watergate scandal, as well as American journalism’s more recent major failures. Noted sociologist, author, and mass media scholar Todd Gitlin joined host Thorne Dreyer, Friday, August 16, 2013, for the second of two Rag Radio interviews. Our conversation with Gitlin centered on the history of American mass media, including the so-called “Golden Age” of journalism highlighted by the distinguished coverage of the Watergate scandal, as well as American journalism’s more recent major failures in its handling of Bush’s War in Iraq, the financial crisis, and the continuing issue of climate change. We also discussed the recent purchase of the Washington Post by Jeff Bezos, and the projected effect of the Internet on journalism’s future. Todd Gitlin is the author of 15 books, including the recent Occupy Nation: The Roots, the Spirit, and the Promise of Occupy Wall Street. He is a professor of journalism and sociology and chair of the Ph. D. program in Communications at Columbia University. Gitlin is on the editorial board of Dissent and is a contributing writer to Mother Jones. His writing has appeared in The New York Times, Los Angeles Times, Washington Post, and countless other mainstream and alternative publications. In 1963-64, Todd Gitlin was the third president of Students for a Democratic Society, and he helped organize the first national demonstration against the Vietnam War and the first American demonstrations against corporate aid to the apartheid regime in South Africa. Gitlin was an editor and writer for the underground newspaper, the San Francisco Express Times, and wrote widely for the underground press in the late ’60s. In 2003-06, he was a member of the Board of Directors of Greenpeace USA. 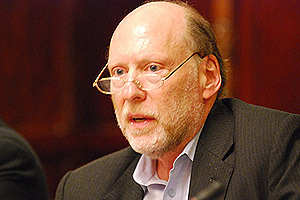 Gitlin’s other books, several of which have won major awards, include the novel, Undying; The Chosen Peoples: America, Israel, and the Ordeals of Divine Election (with Liel Leibovitz); The Bulldozer and the Big Tent: Blind Republicans, Lame Democrats, and the Recovery of American Ideals; and The Intellectuals and the Flag. He is also the author of Letters to a Young Activist; Media Unlimited: How the Torrent of Images and Sounds Overwhelms Our Lives; The Twilight of Common Dreams: Why America Is Wracked by Culture Wars; The Sixties: Years of Hope, Days of Rage; Inside Prime Time; and The Whole World Is Watching. Rag Radio is hosted and produced by Rag Blog editor and long-time alternative journalist Thorne Dreyer, a pioneer of the Sixties underground press movement. Tracey Schulz is the show’s engineer and co-producer. Rag Radio has aired since September 2009 on KOOP 91.7-FM, an all-volunteer cooperatively-run community radio station in Austin, Texas. Rag Radio is broadcast live every Friday from 2-3 p.m. (CDT) on KOOP and is rebroadcast on Sundays at 10 a.m. (EDT) on WFTE, 90.3-FM in Mt. Cobb, PA, and 105.7-FM in Scranton, PA. Rag Radio is now also aired and streamed on KPFT-HD3 90.1 — Pacifica radio in Houston — on Wednesdays at 1 p.m. The show is streamed live on the web and, after broadcast, all Rag Radio shows are posted as podcasts at the Internet Archive. Friday, August 30, 2013: Educator and “Small Schools” advocate Michael Klonsky, former National Secretary of SDS. Friday, September 6, 2013: Award-winning novelist and screenwriter Stephen Harrigan, author of The Gates of the Alamo and Challenger Park. This entry was posted in RagBlog and tagged Interview, Journalism, Mass Media, Media Criticism, Media History, New Left, Podcast, Rag Radio, SDS, Sixties, Sociology, Thorne Dreyer, Todd Gitlin. Bookmark the permalink.